Keep track of your to-do list with the the tasks tool in HubSpot. You can easily access the records associated with each task. Sales Hub Professional or Enterprise users can also automate tasks on deal stages. 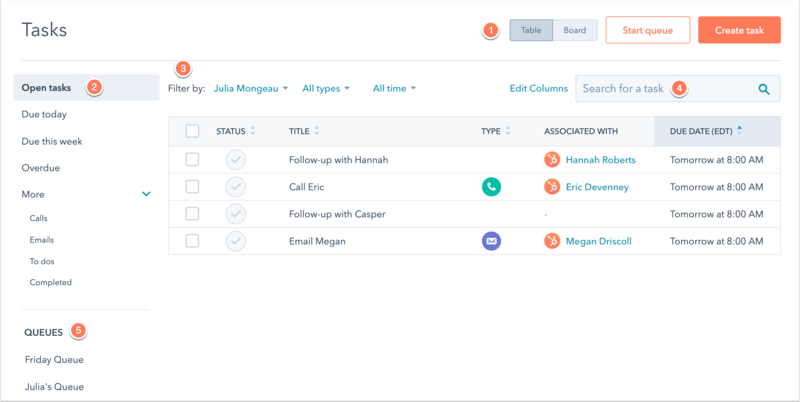 In your HubSpot account, navigate to Sales > Tasks. In the upper right, click Create a task. Title: enter a task name in the Title field. 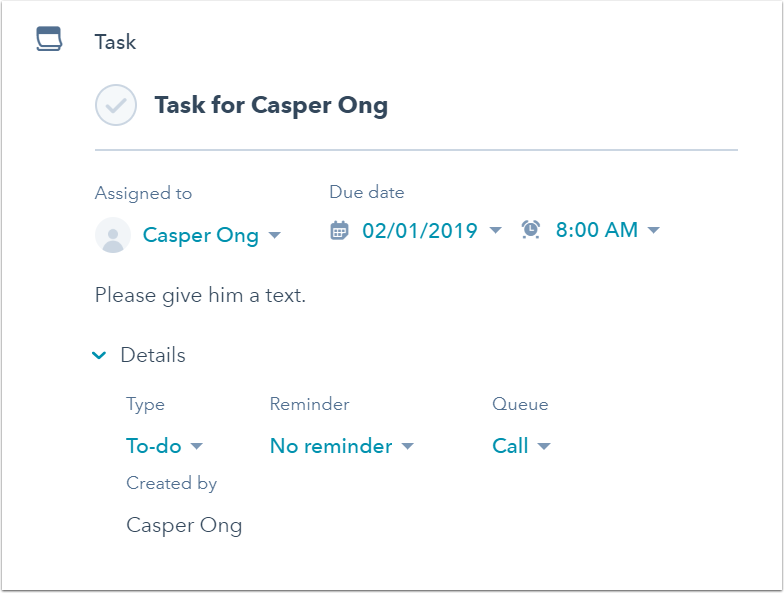 Include the text call or email in the title of your task to automatically set the corresponding task type. Associate with records: click the dropdown menu to search and select records to be associated to the task. Due date: click the dropdown menus to select the due date and time. Email reminder: click the dropdown menus to select the date and time of the email reminder to be sent to the task owner. Notes: enter details about your task. Type: click the dropdown menu to select Call, Email, or To-do as a task type. Queue: click the dropdown menu to add the task to an existing task queue or to create a new task queue. Assigned to: click the dropdown menu to select a user the task will be assigned to. Click the name of the contact, company, deal, or ticket. In the left panel, click Task tasks. Title: enter the task's name. Include the text call or email to automatically set the corresponding task type. Due date: click the dropdown menus to select a due date and time for the task. Notes: enter details on your task. Associated with X record(s): click the dropdown menu to view, add and remove any other records to the task. Task type: click the dropdown menu to select Call, Email, or To-do. Assigned to: select a user responsible for the task in the Assigned to dropdown menu. Email reminder: click the dropdown menus to select a date and time for an email reminder to be sent to the task owner. Queue: click the dropdown menu to add the task to an existing task queue or to create a new task queue. Choose None if you don't wish to add this task to a task queue. In the left panel, click Email email or Call calling and enter the email or call information. 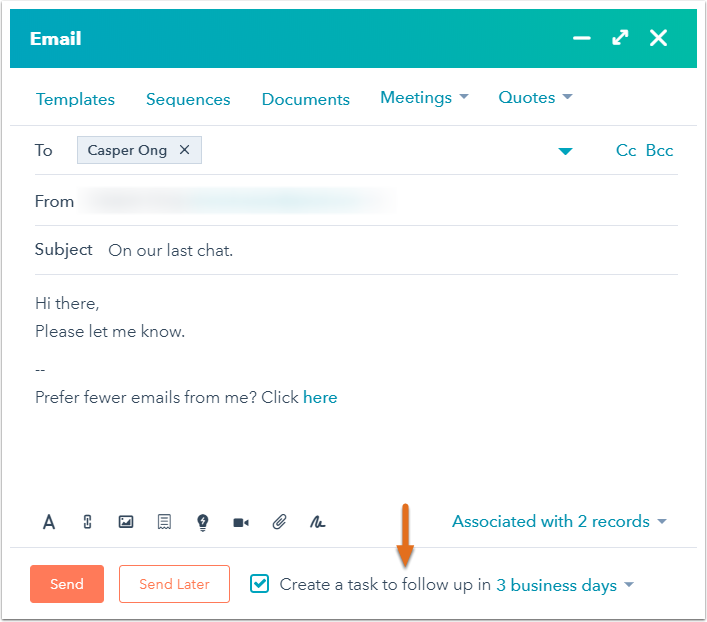 Before sending the email or saving the call, select the Create a task to follow up checkbox and click the dropdown menu to set a due date for your task. Select the checkbox next to the records. For contacts, click the More dropdown menu in the header row and select Create tasks. For companies and deals, click + Create tasks in the header row. In the right panel, enter the details for your tasks, then click Create. Open the HubSpot app on your device. In the bottom navigation menu, tap Digest. In the Tasks section, tap the plus icon +. Set a title, type, and due date for your task. By default, the task will be assigned to you. Tap the Assigned To field to change the assignee. 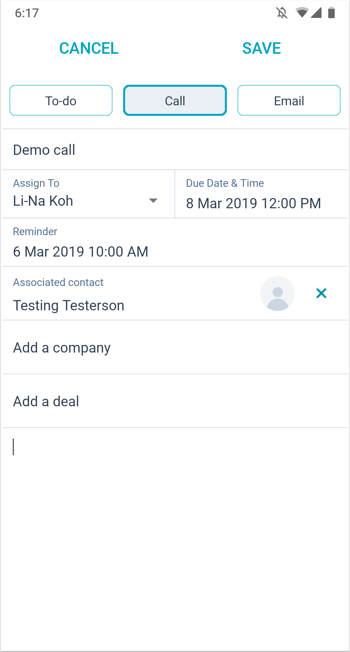 Tap the Associated Contact, Company, or Deal field to select records to associate with the task. You can also add a task from a contact, company, deal, or ticket record. In the bottom navigation menu, tap Tasks. In the lower right, tap the plus icon +. Set a title, type, and due date for your task. By default, the task will be assigned to you. 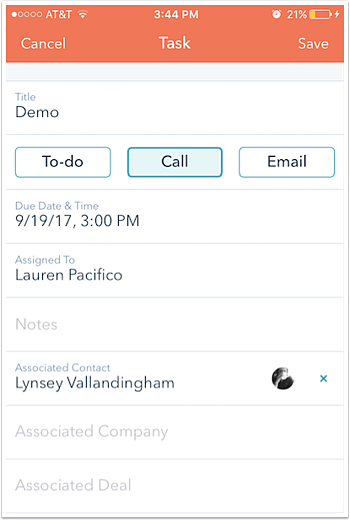 Tap the Assign To field to change the assignee. Tap the Add a contact, company, or deal fields to select records to associate with this task. Create different task queues to organize your to-do lists and complete tasks in a series. In the left sidebar, click Add a queue. Enter a name for the queue and click Save. Select the checkbox next to the task(s). In the header row, click + Add to queue. In the dialog box, click the Queue dropdown menu and select a queue. Then, click Add. In the left sidebar, click the name of the queue. If needed, drag and drop tasks in the queue to change their order. In the upper right, click Start queue. You'll be redirected to the relevant record to complete your task. Click the checkmark icon next to the task on the timeline to mark it as complete. Click Next to move to the next task in your queue. You can also leave the task uncompleted and click Skip if you want to leave a task for later and move onto the next one. Please note: each task queue has a limit of 500 tasks and each user has a limit of 10 task queues in each account. If you need to create a new queue and have reached your limit, consider deleting a completed queue to create a new queue. Table/Board: click to toggle between view types. 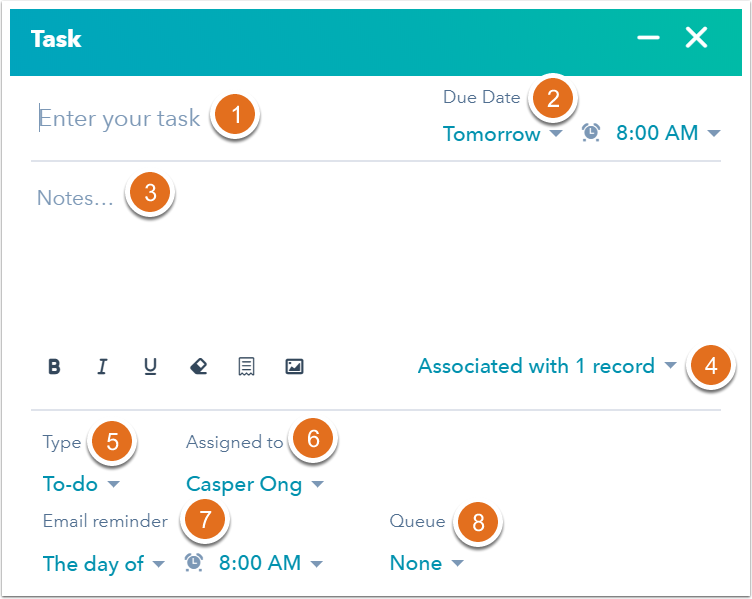 The table view shows a list of your tasks, while the board view allows you to drag and drop tasks to different statuses. Status: click to view task by status. Filter by: click the dropdown menus to filter your tasks by assignee, type, and due date. Search: enter terms to search for a specific task. Queues: click the name of a queue to view the tasks in the queue. Click the name of a task on the dashboard to edit or delete it. To mark a task as completed, hover over the task and click Mark as complete. Learn how to export your tasks. To view any tasks associated to the record, click Tasks in the middle panel. Delete: click to delete the task. Complete: click the complete icon success to mark the task as complete. Details: click to reveal the following options. Please note: it is not currently possible to export tasks from HubSpot.